Sorry if this seems like an obvious question I should know the answer to. I have a Particle System in the engine, and when the game starts, I want this to be invisible. I want this to be invisible until a character walks into a collision box, which is when the fire lights up and starts burning. I think this is what you're looking for? With this it isn't invisible, it doesn't even exist until the character enters the box. Which will save some CPU time and give the cool effect of the fire just starting, instead of an already burning fire just becoming visible. HaxO, this hasn't worked unfortunately. I didn't really explain what I wanted clearly the first time round. I want the fire to be non-visible to the player when the game starts, and I want it to fire up when the player enters the collision box. It sounds extremely simple to me but I can't figure it out for the life of me. What is posted above will do exactly that, if your particle system is set up for it. Okay, it's working now. But the emitter is spawning below the floor despite me setting to spawn at the characters location. Is there a way I can choose where I want it to spawn rather than having it set where the character is? 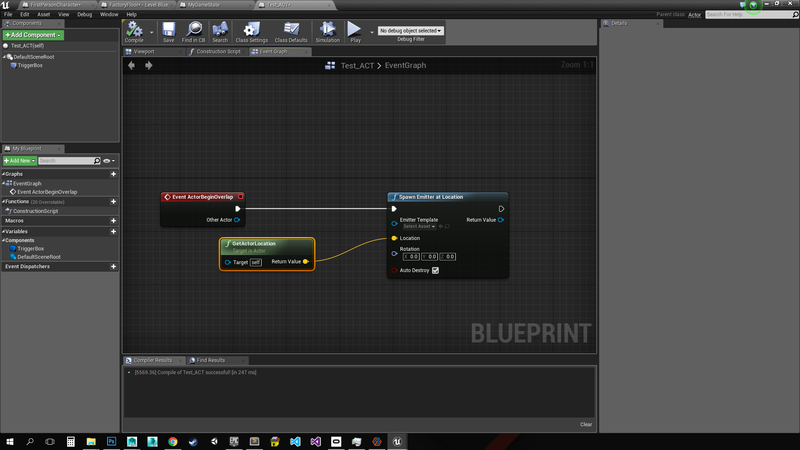 Also, it sounds like you put the above logic onto your character blueprint. This should be a seperate Actor blueprint that you can place in the level. Then when you use Get Actor Location for the spawn loc, it will spawn wherever the Actor is placed. Not on your character. No problem, please accept the answer to help out others with this problem in the future. Creating a squared/triangular beam particle system? How to increase speed of a particle system?